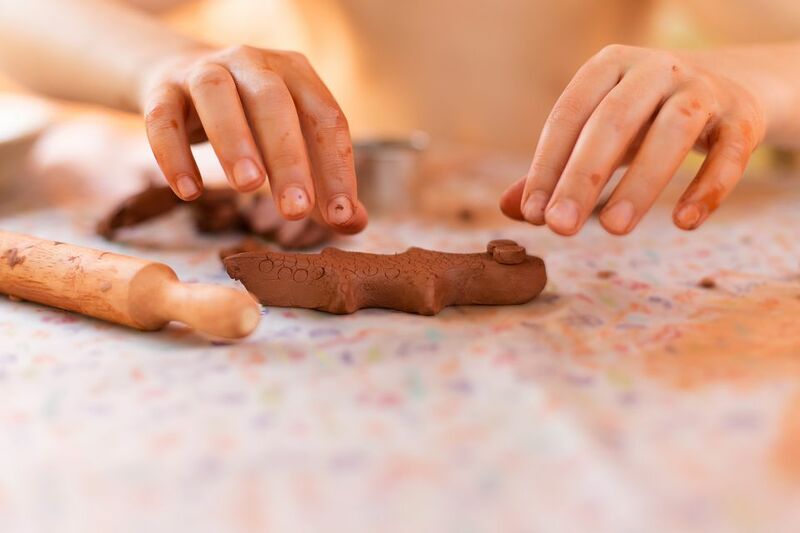 It's easy to make clay at home with just flour, salt, water, and vegetable oil. Also known as salt dough, the clay can be shaped into any form, baked and then painted. If you don't have easy access to an oven or if you don't want to heat up your kitchen, the clay can be air-dried for 48 to 72 hours. Store-made clay can be expensive, so this low-cost alternative will help you be crafty on a budget. As long as you can tolerate gluten, this clay is safe to eat—it probably just won't taste good. It's a great way to get children into crafts without having to worry about little ones tasting their art. Add the oil, and then slowly add the water and stir until you get a nice clay consistency. If you want the dough to be different colors, separate the clay into portions and put them in a bowl. Add a couple of drops of food coloring to each portion and mix well with a spoon. Be prepared that the food coloring may stain your fingers while working with it! Once completely mixed, make into the desired shapes. Bake in a 250 degree F oven for approximately one hour, though the timing will vary depending on how thick your creations are. Bake it long enough for the clay to harden but not start to burn. Clay rainbow: Divide the clay into seven equal portions. Use food coloring to change the dough to the colors of the rainbow. Roll the dough into long, thin strands and form each into an arch shape, joining the strands together to make a rainbow. Bake or dry the clay and then varnish it. Christmas tree ornaments: Use cookie cutters to cut out shapes such as stars, trees, hearts, and snowmen. Use a craft stick or pencil tip to draw designs into the dough, and punch a hole through the top. Bake or dry the clay, and then paint it with fun designs. Thread ribbon or yarn to the hole and hang it on the Christmas tree. Catepillars: Divide the dough into 10 pieces, with one piece slightly larger than the others. Use food coloring to dye each portion the color of your choice. Roll each piece into a ball for the body; the larger ball will serve as the head. Snip a pipe cleaner into eight shorten portions. Push one pipe cleaner into each side of the balls, except for the head, and bend them slightly. These are the legs. Push two googly eyes into front of the head. Join the balls together, end to end, and let it dry or bake the clay. Finish it off by varnishing the catepillar. Don't make your clay projects too thick, or they will crack when baked. Use cookie cutters to help make more precise shapes. If you want your clay to have a golden appearance, brush your pottery with egg yolk before placing in the oven. After baking, decorate your projects with acrylic paint.